Corporate responsibility is considered an oxymoron by much of society. Corporations are among the least trusted of our institutions; and the 2008 financial crisis, BP's oil spill in the Gulf of Mexico, and the collapse of the house of cards that was Enron have only added to public skepticism. So, at a time when trust in corporations has reached an all-time low, why is interest in corporate responsibility at an all-time high? A plausible explanation is that increasing numbers of stakeholders are demanding responsibility from corporations. Hyper-transparency of corporate activities, fueled by disclosure laws and the Internet, has increased awareness to the point where corporate behavior is under constant scrutiny. Smart business leaders are aware of this scrutiny and of the high costs of a public scandal. They know that in the long run it is cheaper to act responsibly now than to dig out from a PR disaster later. Tim Mohin is a veteran corporate responsibility practitioner who has led programs at Apple, Intel, and AMD. In this book, Tim tells us why he believes he is making a difference where it counts and how others can do the same. His book is a manual on how to steer the corporate supertanker toward doing good for people and our planet. 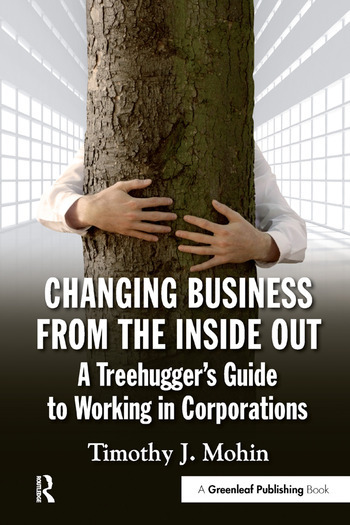 Changing Business from the Inside Out provides a fascinating roadmap to the corporate responsibility and sustainability field, from beginning a career, to forming a program, to navigating the complicated politics of a corporation. Mohin likens the corporate treehugger role to "being the designated driver at the corporate cocktail party". Throughout his book, he argues strongly that activists can accomplish more for the planet and society by serving as a voice of responsibility within the corporation rather than protesting outside the factory gates. Corporations are clearly the drivers of the world economy, and the corporate responsibility practitioner has an essential role in bringing ethical and sustainable values to the C-suite and making sure that they are accomplished. Whether you are a practitioner needing advice, a mid-career professional wanting to change course, or an MBA wondering how to incorporate responsibility into your career, this book has the answers you need.